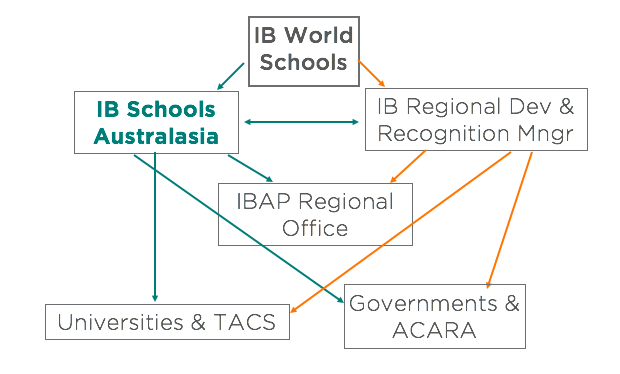 IB Schools Australasia (formerly AAIBS) was established specifically to assist schools in Australasia, providing a network of professional support, information and service. Schools new to the IB programme will find such assistance particularly useful. The Association also organises an annual Speaker Series and produces a newsletter and a variety of support materials. To support the goals and objectives of the International Baccalaureate Organisation and the IB World Schools in Australasia. To provide support for the International Baccalaureate programmes in Australasian IB World Schools. To facilitate communication among International Baccalaureate schools in Australasia. To liaise on behalf of IB Schools Australasia member schools with the Ministries of Education and with professional educational organisations in Australasia. To act upon request or when deemed necessary so as to promote the recognition of the International Baccalaureate Diploma as a qualification for entry to universities in Australasia. To support the professional development programmes of the International Baccalaureate in particular those sponsored by the International Baccalaureate originating in member schools. To promote research into the benefits of the International Baccalaureate programme and examinations. The income and property of IB Schools Australasia (formerly AAIBS) shall be applied solely in furtherance of its purposes and no portion shall be distributed directly or indirectly except as compensation for services rendered or expenses incurred on behalf of the Association. Free graduation certificates for students in all four programmes. Being part of a body of Australasian IB World Schools - vital for lobbying governments, educational authorities, admissions centres, universities etc. Want to join IB Schools Australasia? As an Association of International Baccalaureate® World Schools, IB Schools Australasia has been formerly recognised by the IB and we work closely with the IB to advocate on behalf of our member schools. Associations can be an indispensable resource for both those schools new to the IB as well as those well-established schools. All Authorized, Candidate and Partner schools in Australia, New Zealand, Papua New Guinea and Fiji are eligible to join IB Schools Australasia. Networking opportunities: Our complimentary AGM professional learning event and Speaker Series events are designed to allow for inter school networking opportunities. IB Schools Australasia Certificates for Students and Awards Booklet Template: Our Certificates for PYP, MYP and DP students can be used for in school and state based awards ceremonies. In 2017, we introduced an Awards booklet template that could be and Network awards ceremonies to recognise student achievements.